Saturday, April. 27, 2019 | 10:30 a.m.
Join us for this fun and educational program in the first of four seasonal sessions! In our spring workshop, led by Mark and Phyllis Mclaughlin, creators of "Urban GreenPlace," we will learn about flowering trees. Following a simple craft, we will go outside to plant a tree together. 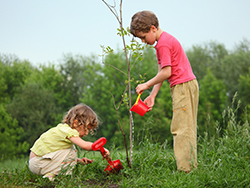 Kids can earn a "Junior Arborist" certificate by attending all four sessions. Dress for rain or shine! Future dates are TBA.